Deluged Tennessee saw more rain Thursday that washed out a commuter rail line a day after flooding swept away a home, trapped drivers in their vehicles and derailed a freight train. Forecasters expected more heavy showers to fall over the Southeast. The downpours that began Wednesday hit some of the same parts of Middle Tennessee that were inundated with severe flooding in May, but forecasters don't expect it to wreak the same kind of havoc. However, no deaths have been reported so far. In Mt. Juliet, just outside Nashville, shop owner Richard Dorer awoke Thursday and was watching the morning television news when he saw the strip mall where his Teach a Child store is located was flooded. The store sells educational books, games and CDs. Dorer said the store was also swamped when historic flooding struck in early May. "That was supposed to be a once in a thousand year flood and now it's twice in a thousand years," Dorer said. "We will be lucky to come back from this." About 4 to 6 inches of rain fell during five hours overnight in the area where Dorer's shop is located, prompting a few water rescues and road closures, said National Weather Service forecaster John Cohen. The storm system had weakened by sunrise and moved east, but not before dumping up more than 11 inches of rain in places like Cookeville, Westmoreland and Carthage. Meanwhile, heavy rains washed out the Regional Transportation Authority's commuter rail track between Lebanon and Mt. Juliet. Buses were sent to ferry passengers between the stations. Most earlier flash flood watches and warnings in Tennessee had expired by late Thursday morning, but a flood warning was posted for Nashville. A flood warning was still in effect for two creeks northeast of Nashville until 7:30 p.m. Thursday. The National Weather Service said as the U.S. Army Corps of Engineers continued to spill water from Old Hickory Dam  upstream from the city on the Cumberland River  the river level at Nashville was expected to reach flood stage. National Weather Service forecaster Bobby Boyd said the Cumberland was expected to reach 40.1 feet at Nashville at midnight Thursday. At that level, Boyd said, there would be minor flooding along the banks in the Pennington Bend area, which flooded in May. There would also be minor flooding of industrial areas close to the river and of low-lying agricultural land. Boyd said people who live in the bend near the Gaylord Opryland Resort likely wouldn't see a repeat of the flooding that hit in May. The river crest is expected to be 12 feet lower than what was seen in May, and Boyd said it is expected to fall quickly. Elsewhere, a flooding advisory was in effect in southeastern Kentucky. And a flash flood watch was in effect for southwestern Virginia and the mountain and Piedmont areas of North Carolina through Thursday afternoon. Pricilla Toepper, 66, of the Double Springs community outside Cookeville, said she had to bring her four horses to a neighbor's fenced yard up the hill from her house because the stables began flooding. A neighbor across the street who was away on a business trip lost three cars to the flooding, and Toepper and other neighbors broke into his garage to rescue his dog and cat because the pet door was submerged. They tried to save more of his belongings, but they didn't have enough time. "We were fighting a losing battle," she said. "It looked like a big roaring mess where those creeks came together. I was so amazed by the force of the water." In southeastern Kentucky, heavy rain figured into at least one injury accident and caused officials to close a state highway, concerned that a mud slide could occur. Kentucky State Police said a man who was trying to drive his car under an overhang at a Corbin supermarket so his wife could stay out of the rain accidentally pushed on the accelerator and backed into the store, running over her Wednesday afternoon. The 76-year-old woman was taken to the University of Kentucky Hospital in Lexington. 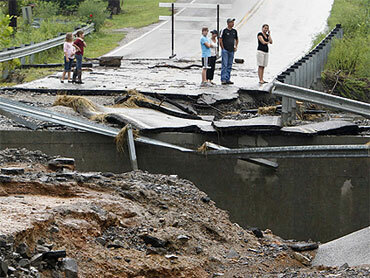 Near Jackson, Ky. 15 remained closed Thursday after closing a day earlier as a precaution. A rock slide had hit the road a month ago. Much of the damage in Tennessee on Wednesday was in Putnam County, where a home floated off its foundation and a train carrying sand derailed when the tracks were washed away. Roads were washed out and some minor bridges were affected, but no injuries or deaths were reported, Tennessee Emergency Management Agency spokesman Jeremy Heidt said. In rural Putnam County, the water had receded by Thursday morning, leaving some toppled trees along stream banks. The remnants of Tropical Depression 5 have been interacting with a weak front over the region, creating waves of moderate to heavy rainfall, but officials did not expect the kind of massive flooding that hit Nashville on May 1. "It's kind of similar but moving through at a much quicker pace, which will keep the rainfall amounts well below what we saw in May," said James LaRosa, a hydrologist with the National Weather Service in Nashville. The floods in May killed 22 people in Tennessee and caused more than $2 billion in damage in Nashville alone. Record two-day rains swelled the Cumberland River.